HACKENSACK, New Jersey, March 19, 2019 /PRNewswire/ — Republic TV, one of the biggest names in Indian news broadcasters, has deployed LiveU’s LU600 HEVC portable transmission units to expand its live transmission fleet. The LU600 was chosen for its hardware-based HEVC encoding capabilities and its ability to deliver flawless HD video with extreme bandwidth efficiency and low power consumption. The LU600 HEVC delivers the highest video quality and bitrate in the market, fastest file transfer and lowest delay. When compared to H.264-based encoders, the LU600 HEVC provides the same video quality while using about half the bandwidth or offers greatly improved video quality wherever original H.264 bitrate is maintained. Using a full hardware HEVC encoder is very efficient on power consumption and allows the unit’s internal battery to last for over four hours of live transmission. Republic TV is India’s most watched English news channel from its week of launch. Founded by Arnab Goswami, Republic TV was launched on 6 May 2017. The channel was launched as a free-to-air channel through DTH services and cable television operators across the country. Republic Bharat (R. Bharat) will soon be storming into the market with the promise to bring news back to Hindi-speaking homes. 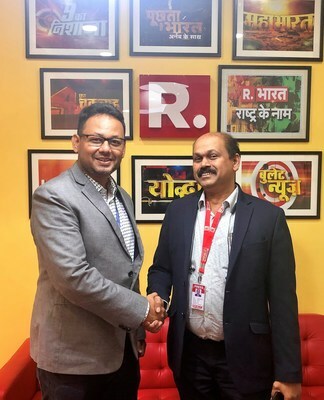 The brand-new R. Bharat aims to shake up the stagnant and satiated Hindi news channels and propel a movement that will actively bring about change and foster patriotism in every nook and corner of the country. As the digital wing of Republic TV, RepublicWorld.com is a platform built for the next generation of news. Seeped in hard-hitting opinion and wound with interactive news content and formats, Republic World follows the principle of breaking the news and breaking the silence. LiveU is driving the live video revolution, providing live video streaming for TV, mobile, online and social media. Let your audience become part of your story with high-quality and flawless live video, transmitted from anywhere in the world, through the use of our patented bonding and video transport technology. LiveU creates a consistent bandwidth and a reliable connection so you can acquire, manage and distribute high quality remote live broadcasts over IP. Our broad portfolio of products sets the industry standard for live video production. From backpacks to smartphones, and satellite/cellular hybrid to external antenna solutions, LiveU offers a complete range of devices for live video coverage anytime, anywhere. In addition, LiveU offers extensive cloud-based management and video distribution solutions. With over 3,000 customers in 130+ countries, LiveU’s technology is the solution of choice for global broadcasters, online media, news agencies and social media. For more information, visit www.liveu.tv or follow us on Twitter, Facebook, YouTube, LinkedIn or Instagram.